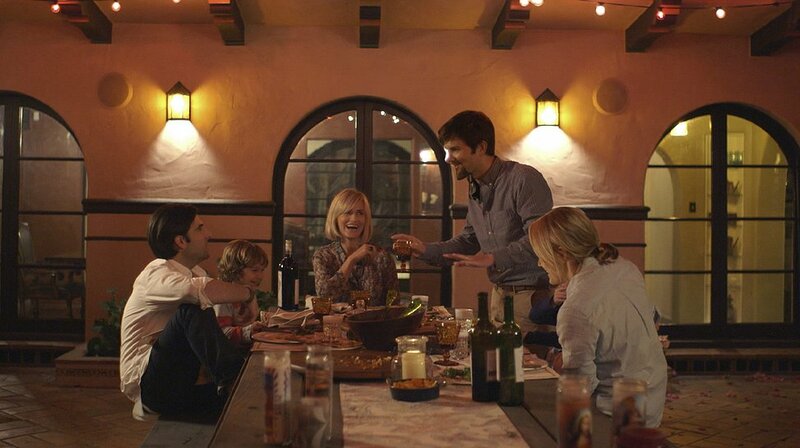 I was surprised by The Overnight (2015), a comedy drama produced by mumblecore star Mark Duplass, and Party Down’s Adam Scott. I expected it to be the usual comic story of middle aged unhappy couples, and their negotiations between aspiration and reality. Instead it was decidedly awkward, with an opening sequence that immediately set the tone for the rest of the film. Scott stars alongside Taylor Schilling (Orange is the New Black) as husband and wife Alex and Emily, who have just relocated to Los Angeles with their young son. They have yet to make any friends, and the film explores the complexities of meeting new people in a new town. Alex is a stay at home dad and he feels trapped by his circumstances. He’s also an anxious person who doubts himself (and his body), and he struggles with loneliness, and self confidence. Emily is more comfortable and grounded, she has a job and supports Alex and their pre school aged son. Kurt (Schwartman) and Charlotte (Godreche). son. The pair are roughly the same age and they strike up a quick friendship. Kurt invites Alex and Emily to join him and his wife for dinner and they agree. What follows is a tense, and often uncomfortable look at contemporary marriage. 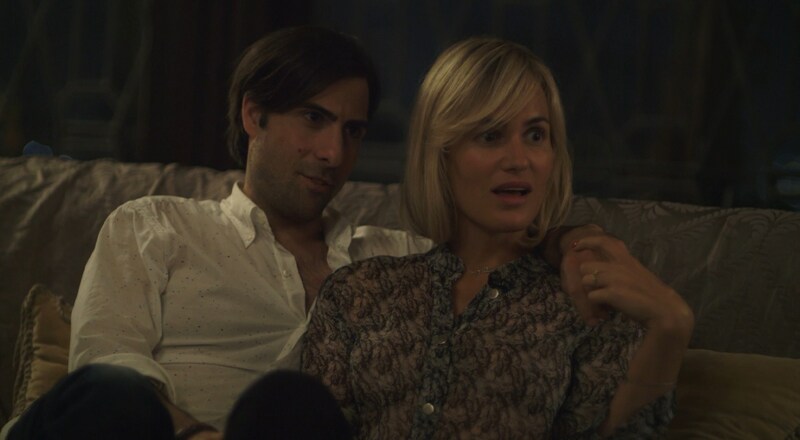 Kurt is bizarre and pretentious, Schwartzman does well in this role, conveying desperation, contentment, and arrogance throughout the long evening. Adam Scott is good too, and his character stands as a contrast to Kurt’s extroverted behaviour – Alex is uptight, he’s tense, and he has a poor sense of self. The ladies are just as interesting and Taylor Schilling is a great partner for Scott. She’s strong where he’s weak, but she’s also constricted by her circumstances and she pines for change and excitement (and communion) too. Judith Godreche plays Charlotte, Kurt’s wife, and she brings a European sensibility to a distinctly suburban American tale. Although The Overnight has some funny moments; there’s Kurt’s art (he’s painting images of people’s assholes), Charlotte is a wannabe actor and she shows Alex and Emily a video of her advertising breast pumps, and there’s a great pot smoking sequence that finishes with skinny dipping in Kurt’s pool; the prevailing tone is one of unease. It’s clear that Kurt and Charlotte have some ulterior motives, but Alex (and to a lesser extent Emily) fall under their spell. The foursome consume numerous bottles of wine, they smoke plenty of pot, and they discover things about each other that are conversely shocking and endearing. But there’s a sense that these are lonely people, and all they’re looking for is a connection of sorts, an experience that shakes them from their complacency, and reminds them that they’re alive. Kurt invites us into a wealthy world where he exerts control over everything he touches. But we see this world through Alex’s eyes so we get an uncomfortable perspective on the events that unfold. Alex and Emily are outsiders and they are far more stereotypical with their lifestyle choices. There’s a suggestion that they’re not quite as free as Kurt and Charlotte, but comparisons become muddied as the film progresses. It becomes more difficult to define where one couple’s life choices stop, and the others begin. Directed by Patrick Kack-Brice, The Overnight is a mumblecore film all grown up. Time takes its toll, and people settle into routines, but we can never truly know ourselves, or what we’re capable of. It seems that circumstances dictate experiences, and although we think we know who we are, we can still step outside of our comfort zones and find something new, and perhaps even exciting. The Overnight features some excellent monologues, a clever ending that mirrors the opening sequence, and it all takes place within one night. The events that transpire are life altering, and the film itself has a great structure, crisp cinematography, and strong casting choices. But it’s not especially memorable, it’s a film that tells a late night story through an intoxicated lens, and like all great boozy stories, the experience is far better (and stranger) than the half formed memories you’re left with. This is a story about conflict, and it considers the way people present themselves to the world. We’re not always honest, but all it takes is time to get to know someone, and people eventually let their masks slip. The Overnight shows we’re not that different after all, but it takes some awkwardness, plenty of social anxiety, and a healthy dose of alcohol and cannabis to realise it. Have you seen The Overnight? Leave a comment and let me know your thoughts. Previous Previous post: Psychedelic Medicines: Have we Illegalised Healing and Salvation?